Add ginger, shallots and chili. Add chili and turmeric powder. 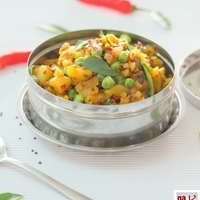 Stir and add the rest of the ingredients: potatoes, green peas, coriander and curry leaves. Continue frying to combine the ingredients; for 3-4mins. Increase the heat and fry for another 2 mins.